David Bowie Is, has finally opened at ACMI, and it is as visually and auditorily as sumptuous as you would expect from the man who has enthralled audiences through music, film and television for generations in just as many glittering and sometimes glum guises. In a time where reality shows churn out mediocre pop stars year after year that (unfathomably) dominate the music charts, it’s an absolute joy to reflect on Bowie’s 50+ year career that has never faltered in aesthetic integrity or conceptual artistry. Seeing for the first time how much creative control over his visual and musical direction Bowie has always had made me appreciate for the first time what a truly remarkable talent he is. There are stage plots, hand scrawled descriptions of lighting design, concept storyboards, paintings, drawings, fashion sketches, thematic character development, photography, puppet designs … Bowie even did a bunch of mime in his early days. If you are creative in any form or craft, David Bowie Is will inspire you. These quiet moments into the artistry behind the superstar genuinely rival for your focus against what were at times overwhelming audio-visuals. Imagining his overflowing sketchpads, diaries and bundles of notes and lyrics, the pieces of visual and personal history that must exist hidden from view was almost unbearable to consider. Bowie is a classic Renaissance man who seems to excel at all he attempts, and like all Renaissance men, we want to know what makes him tick. With the touring exhibition already attracting over one million visitors globally, clearly there are grounds for a Bowie Museum. Consider this my recommendation. Of course, collections of objects related to pop culture artists are fun and illuminating if you are already a fan, but they cannot replace the power of experiencing the work created by the artist. Despite my glowing reports of David Bowie Is, I am increasingly alarmed at the number of pop culture stars and designers snatching up the scarce real estate on major museum calendars. Artists like Bowie already command massive fan-bases through media arenas they have privileged access to and it very dangerous to divinate the number of gallery visitors brought in by celebrity-status artists as equal to a certain quality of audience engagement. New York’s MOMA learnt this the hard way recently with their widely ridiculed Bjork retrospective. Gallery Directors need to learn that you cannot simply plonk an icon’s fashionable remnants in a gallery and crudely insult your audience by expecting they will consume it with the same fervour they would their idol’s art. It does beg the question though: why don’t we have pop culture specific museums yet for these types of exhibits? It’s high time we began giving dedicated spaces to cultural and celebrity icons, artefacts and histories to avoid this clearly uncomfortable jostling for space in museums and galleries which are the only current platforms to view more traditional forms of art. To illustrate this point, notably missing from David Bowie Is was a screening or listening room where one could watch the video clips, live footage or listen to his many albums. This seems like a significant oversight that felt frustratingly as though the curators and organisers were more than aware that they could cash in on Bowie’s legions of fans as guaranteed ticket sales, rather than concern themselves with genuinely introducing his work to new audiences. 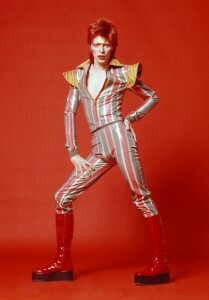 Fans, myself included, do not love Bowie the celebrity; we love Bowie the singer, producer, dancer and actor. I thoroughly enjoyed the glimpses behind the scenes into his impressive process and encourage any fan to check it out, but it would have been so wonderful to just sit in a room with other fans and bliss out on an album together. This is what my pop culture museum of the future looks like. There is a significant roster of public programming, including films, workshops and David Bowie Is Late Nights - a live music program each Thursday evening until November 1st from 6-10pm. Check it all out soon as ACMI events often sell out quickly. This entry was posted in Arts, Music and tagged ACMI, David Bowie, melbourne, music, pop culture, pop icon, Review. Bookmark the permalink.